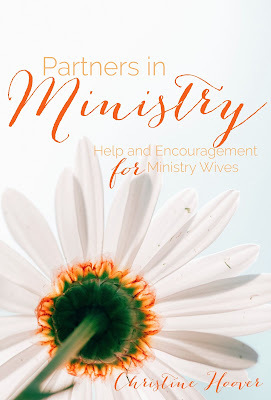 I have written about my own experiences in ministry on this blog for years, all of which I've compiled into an ebook, Partners in Ministry: Help and Encouragement for Ministry Wives. Written for women serving in any variety of ministries (in established churches, in church plants, on the mission field, in ministry organizations) and in a variety of roles, the book is meant both as a resource and an encouragement. So you know that in what you're feeling and what you're experiencing you're not alone. The ebook is divided into six parts, each part packed with essays that both speak to the heart and offer practical help for ministry. Below are the six parts and a sample of the writing you'll find in each. Purchase the ebook for $2.99 on Amazon, Barnes & Noble, or iTunes.